Spruce up some mason jars with lace, twine, ribbon, or cloth and bunch them together and fill them with flowers to create beautiful centerpieces. These lovely florals were arranged by Ines Naftali and captured by 13 13 Photography. See the wedding here. Set the mood with a lovely mason jar chandelier. If you're feeling particularly crafty you can take a stab at DIY'ing this beauty or you can purchase one here from Boots N Gus, available in numerous colors and styles! We love the idea of using mason jars as a less expensive alternative for cocktail glasses! You can even let your guests keep their glasses at the end of the night. Need some cocktail ideas for your big day? We've got you covered here. 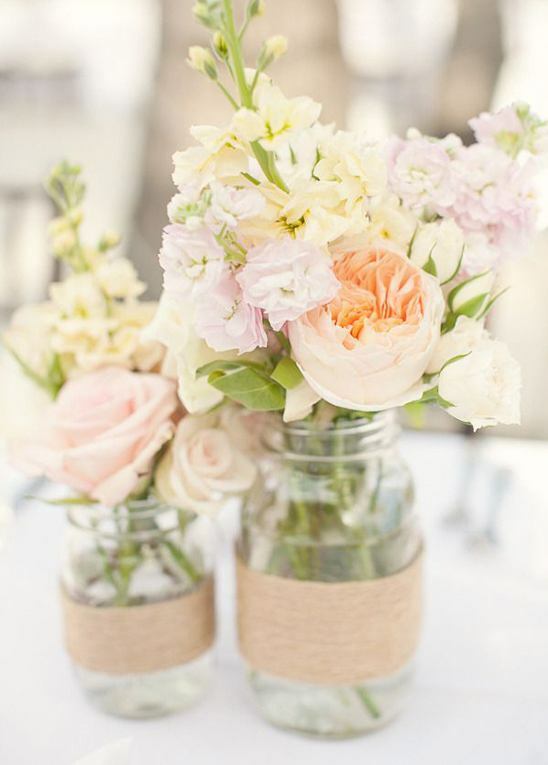 Sweeten up your ceremony seating with some lovely hanging mason jar florals. These beautiful peonies came from an equally wonderful wedding seen here, styled by Lovely Little Details and captured by Volatile Photography. Such a cute idea for a winter wedding! If you want to add these darlings into a different season wedding just swap out the cranberries for something more appropriate and voila! See more wintery wedding ideas here. While we're on the topic of winter weddings....we think these mason jar hot cocoa recipe favors are simply the cutest! Not getting married in winter? There are a ridiculous amount of crazy cute mason jar recipes to choose from. These jars, and this lovely shoot, were dreamt up and photographed by Andrea Dozier and Simply Photography. On your wedding day Anything can happen so it's best to be prepared. Ensure that any wardrobe malfunctions or stress overdoses don't ruin your day with this handy dandy mason jar wedding day emergency kit. Find out how to DIY this kit here, courtesy of A' Casarella. Get your groomsmen ready to go with these man-friendly mini mason jar shot glasses! Get more info and purchase them here from Bourbon and Boots. Fill 'er up! Use mason jars to hold your wedding odds n' ends, anything from straws and silverware to rock candy on your dessert table! See the rest of this wedding here, captured by Cluney Photo. There are so many fun ways to include table numbers into this mason jar jamboree. Think chalkboard mason jars with colored chalk numbers, wooden table numbers tied to mason jars with string, buoyant numbers floating in the mason jars, etc, just get creative! The lovelies above were photographed by Jennifer Sando with flowers by Lotus Flower Shop. Having an outdoor wedding? Keep your drinks safe from bugs and debris with mason jars complete with lids! We love these sweet tea and sparkling berry water favors that guests can drink there or take home for later. Learn how to make them from Thirsty For Tea. An easy and lovely way to add mason jars to your wedding without Actually adding mason jars to your wedding is to theme your wedding stationery suite around them! This rustic goodness invite was made by Invitations From Dawn, see more of her designs here. Add mason jars into your decor with simple ideas like the one above. We're smitten with those cute crochet cozies! See the beautiful shoot the belong to here, captured by 35mm Photography. Light up your night with mason jar lanterns. Use them to hang from the trees, line the aisle of your ceremony, or illuminate indoor spaces. These hand painted mason jar lanterns come from Free People but could also be easily DIY'd. Last, but certainly not least, is this overly phenomenal dessert bar idea! Stick ice cream in mason jars and put them on ice. Then lay out the table with treats and toppings. When your guests are ready for dessert the jars will double as their bowls so all they'll have to do is pop the lid and add the toppings they desire! This fun idea came from Colin Cowie Weddings.